When I was an undergraduate, way back when, we played board games like Risk, sometimes all night. We still have the odd game of Monopoly at Christmas, but I hadn’t realised that board games were a Thing until my daughter told me that was what they did on holiday – and I found that my son-in-law actually helps lead a board gaming group. So I said ‘Who’d have thought it?’ and moved on. Then last autumn with my lovely colleague Maria Nita I was invited to Swansea Museum to talk about pilgrimage at an open day, part of the National Museum’s ‘Saving Treasures – Telling Stories’ project. This does what it says – telling the stories behind some of the little objects handed in as part of the Portable Antiquities scheme. Some of the finds in Swansea Bay were pilgrim badges and they wanted to know more about them. This led to more events involving Museum volunteers, women’s groups from Gower and the lovely lads from the Gurnos Men’s Support Group. We walked them along our pilgrimage route to Penrhys and they went mudlarking in Swansea Bay. And the Museum came up with the idea of a board game. I think they were thinking of a fairly simple children’s game – fall in the river, throw a double to get out, find a good hostel, get a second go, and so on. But I took to wondering about a grown-up game as well. You could choose an avatar (Margery Kempe, anyone? ), collect the kit, choose your route, have all sorts of decisions to make on the way. My son-in-law suggested we look at a game called Tokaido because it was one of the earliest journeying board games. A couple of colleagues said they were interested – one is a member of a board gaming group in Cardiff. Then it all fizzled out. Until this week when there was something on Twitter about the Reformation board game https://boardgamegeek.com/boardgame/200834/sola-fide-reformation – see thread at https://twitter.com/heritagepilgrim/status/904452513730101248 – and I replied that I had thought about designing a board game on pilgrimage. There was a surprising amount of enthusiasm. Here’s a suggestion for the board https://twitter.com/nickswarb/status/904841167925387264 and a lot of ideas about detail. History of Religious Women (@H_WRBI ) wanted ‘rivalry between Jesuits &bishop, please? Need to bet on which shrine you should work towards, with SJ/Bp conflict in background’. I explained that being a medievalist I’d been thinking of something medieval . @H_WRBI said fine, bishop and Dominicans, we could do the post-Ref version as extension. Now, I know next to nothing about designing board games – and even less about online games, which I think this one might have to be. But it does seem like a fun idea. You could choose a character – one of Chaucer’s pilgrims, maybe? You could start by collecting the standard kit – hat, scrip, boots, staff – and getting it blessed by the bishop. You could have the option of other kit, either to help on the journey or to get extra points (take along a relic to be blessed, a reliquary to collect something at the shrine, carry a heavy cross so you are slower on the journey etc). You could choose a destination – further afield gets more points but you are more likely to lose. We do actually have a framework for this: Pope Callixtus, bless him, decreed that 2 journeys to St David’s in west Wales were the equivalent of one to Rome, and three were the equivalent of one to the Holy Land. (This was a particularly good deal if you lived in Swansea, I seem to remember saying.) You could get extra points for going to other shrines on the way – again, we have evidence for this, guide books to the route to Compostela mention other places you could visit en route. There are all the things that could happen to you on the way – again, the Compostela guide books mention plagues of flies and wasps, poisoned rivers, boatmen who tip you in the river. I’m just putting this blog post out there – do reply with ideas, and if anyone is good at designing board games or online equivalents, we can all get in touch. 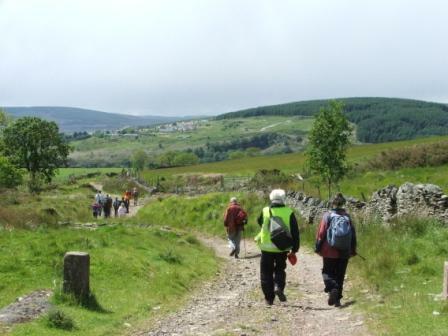 The route over Mynydd Maendy and the Afan-Ogwr watershed still looks like the best route for the Cistercian Way – clearly an old trackway, magnificent views (weather permitting) and the shortest off-road route. 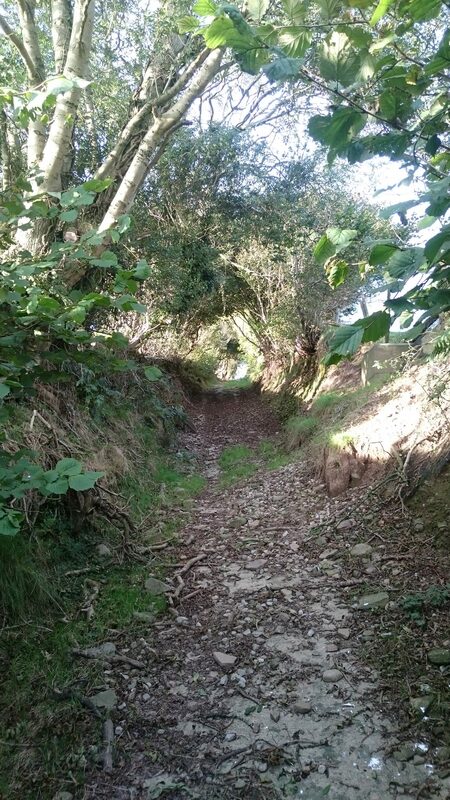 But it probably isn’t the way medieval pilgrims like Gwilym Tew would have gone. Old, overweight, carrying that massive candle, he would most likely have taken the gentler route from his home near Llangynwyd, via Llangeinor and Llandyfodwg (now better known as Glyn Ogwr) and over Mynydd William Meyrick. According to the RCAHM Glamorgan inventory the route over Mynydd William Meyrick is medieval. The rest has to be deduced from the line of byways and green lanes. I’ve been meaning to look at this route for some time. 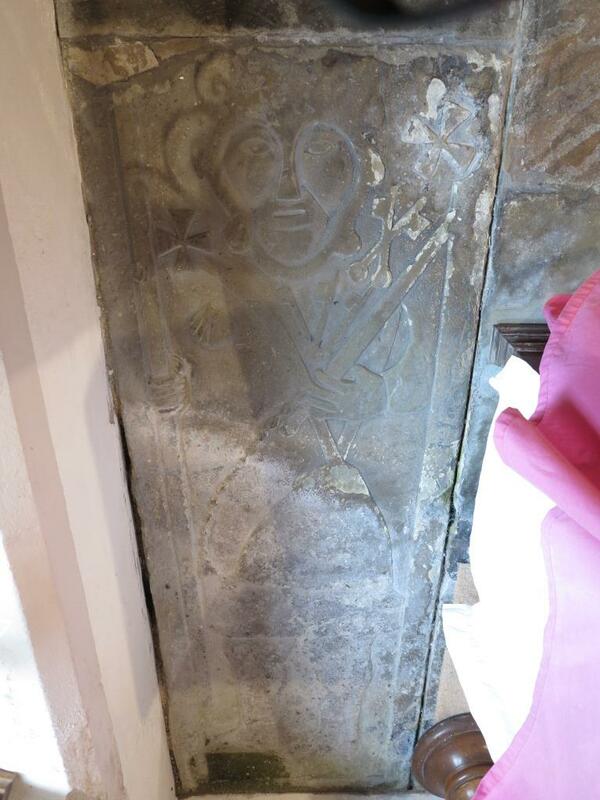 Then I went to Llandyfodwg with Tristan Gray Hulse to look at the famous medieval effigy slab there. It depicts a pilgrim with staff, satchel and badges including a scallop shell, the crossed keys of St Peter and – crucially – another badge showing keys on a ring. Tristan thinks this may actually show the saint himself. According to legend, Tyfodwg locked himself in chains as a penitential act and threw away the key. He then went on a pilgrimage to Rome, where he found the key in a fish he was given to eat. There is another Welsh parish named after Tyfodwg: the old name of Ystrad Rhondda, between Treherbert and Tonypandy, was Ystradyfodwg. Before the Industrial Revolution, this was a huge and sparsely-populated curacy, covering the whole of the Rhondda and dependent on the rectory of Llantrisant. (This all looks like the remains of a minster church set-up providing for the spiritual needs of a small Welsh kingdom.) The old church in Ystradyfodwg was where Ton Pentre church is now (the Cistercian Way goes past it). As far as we can see from surviving records, though, this church was never actually dedicated to Tyfodwg: the earliest sources record it as dedicated to St John the Baptist. Was this an early second millennium rededication? Possibly – or (the theory on the Llandyfodwg church web site) was Tyfodwg an early Welsh ruler of the whole area who brought Christianity there and was eventually regarded locally as a saint? So the whole Rhondda area was Ystrad Dyfodwg, Tyfodwg’s valley, and Llan Dyfodwg was possibly the church where he died and was buried. Mike Ash of the Glamorgan Ramblers has looked at old maps of the area around Ton Pentre. A trackway ran north of where the church is now. There seems to have been a bridge just north of the modern bridge, and there are also rocky outcrops which could have provided the supports for a medieval timber bridge. Writing in about 1540, the antiquarian and general surveyor John Leland said there were timber bridges across the two Rhonddas just west and east of Penrhys. 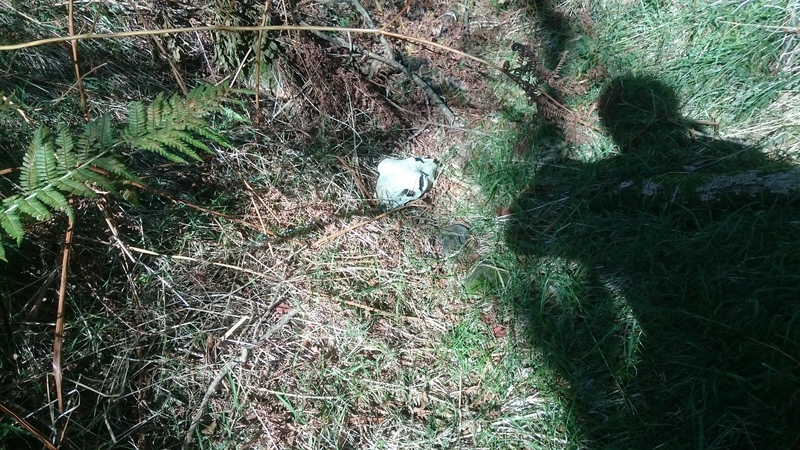 and some travellers clearly didn’t make it … . 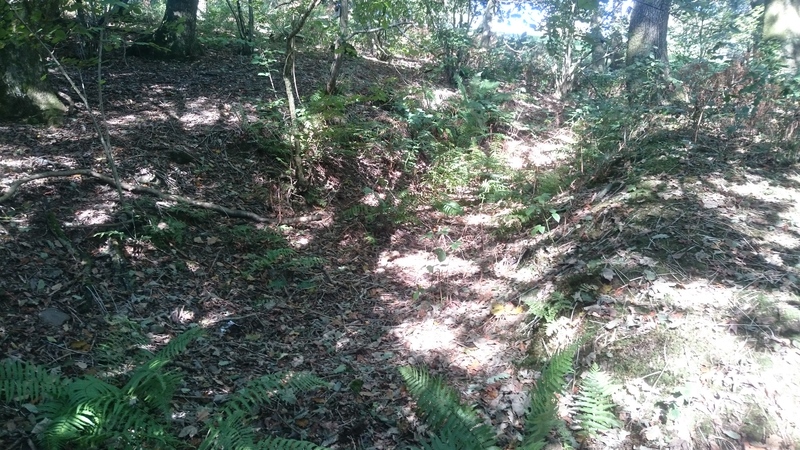 This hollow lane continues up the edge of the fields to SS 94439 88211, skirts the coal tip (suggesting it was an old boundary) and goes into the forest at SS 94171 88861. From here it follows the forest road to SS 94999 90679 then cuts across the angle of the forest road to the edge of the forest at SS 95271 91052. 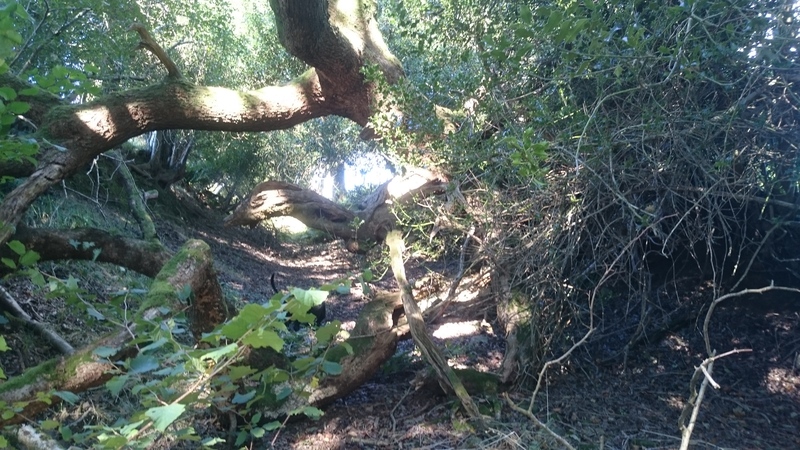 This section has had a lot of off-roading damage. 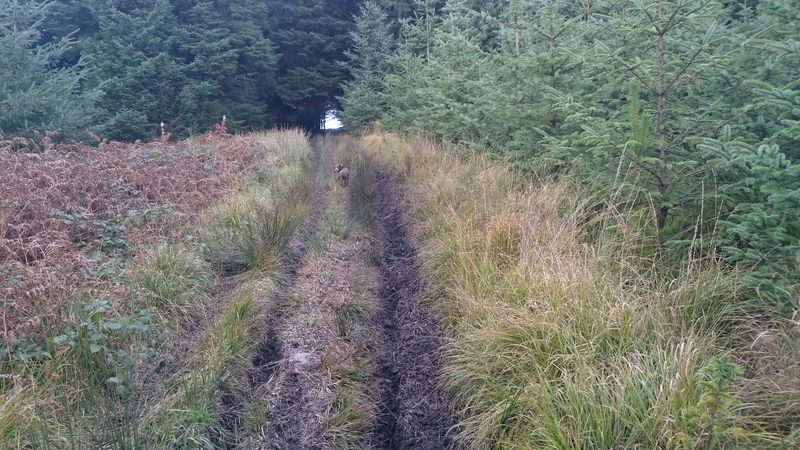 Nell likes off-roading damage because it makes puddles. Cara doesn’t like it because she gets stuck in the ruts. The track continues round the head of Cwm y Fuwch. From there it has been interrupted by the building of yet another wind farm but it should be possible to pick it up again as it climbs to re-enter the forest on Mynydd William Meyrick at SS 95636 92082. From there it slants down along forest roads and presumably follows the line of the public footpath down the steep side of Cwm Cesig and into Ton Pentre. and seems to be waymarked from Llandyfodwg at least as far as SS 96269 90405, where it descends into the valley of the Ogwr Fach. This might be a better route for any walk between the two churches. 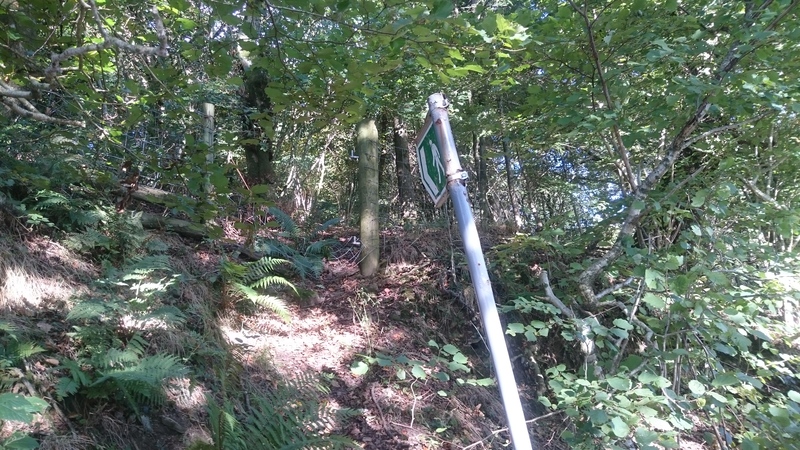 From this point, where the bridleway crosses the windfarm access road, your best bet would be to follow the access road to SS 95711 91940, bear left with the road to SS 95601 91865 and pick up the line of the footpath into the forest.